* Please note that the following passages have been reproduced with the permission from the Yoshukai Karate International web site (www.yoshukaikarateinternational.com). The history and lineage of Karate can be traced back to Okinawa over three hundred years ago. Okinawa was a trading partner with China and the lands of the Far East. Much of the martial arts influence came from China. In the early 1500’s the Okinawa King banned the ownership of weapons. This small island was located between China and Japan, giving to conflicts from both sides. In the early 1600’s Japan invaded and conquered Okinawa, being unarmed played a major role in the birth of karate (empty hand) combat, the art we know today. Mike Foster was stationed at Itazuke air force base in the late 1950’s and studied with Sensei Watanabe who taught Goju karate at the Itazuke Administration Annex base gym. He would earn both Sho Dan and Ni Dan rank from Sensei Watanabe. Mike Foster was sent back to the United States in 1963. After recovering from respiratory problems Mike Foster went back to Japan in 1964. His former instructor SenseiWatanabe was good friends with Sensei Mamoru Yamamoto, who would visit the gym twice a month. At this time Mike Foster was introduced to Yamamoto who was under Dr Chitose. Foster would train for the next 10 months under Yamamoto, returning to the U.S. for a short time. This would go on for the next three years traveling back and forth. 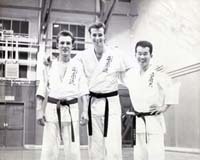 Foster received his 3 rd Dan rank on October 20 th 1964 from Master Yamamoto. Then his 4 th Dan on October 20 th 1965, 5 th Dan on June 10 th 1969, 6 th Dan on January 17 th 1971, 7 th Dan on Feb 15 th 1976. Foster was the U.S. officer of Yoshukai karate during the mid 60’s, his mission was to expand the number of Yoshukai schools in America. Sensei Foster became the United States karate champion in kumite for the years 1966, 1967, 1968 and 1969. He was known as the Fighting Sense. 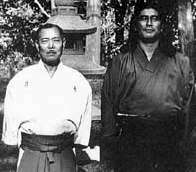 In 1971 Mamoru Yamamoto split from his instructor Dr. Tsuyoshi Chitose (10 th Dan, the founder of Chito-Ryu Karate) and withdrew from the Japanese Chito-kai Karate Federation. Foster would follow his instructor until the late 70’s when he would move on to start his own association. Mike Foster’s Yoshukai International Karate Association would grow to include portions of the United States; Florida, California, Alabama, Georgia, Illinois, Puerto Rico. The international counties include Vancouver British Columbia Canada, Germany, Latvia, Australia, and New Zealand. In 1990, Mr. Foster formed the Yoshukai International Karate Association’s testing board to provide a standardized ranking method for student being promoted to the dan ranks of his system. The board’s Executive Director is Mr. Michael McClernan; the testing board consists of 4 th degree black belts (and above) and is divided in two separate boards, one for kata and one for kumite. The board is overseen by Mr. Foster. After twenty-seven years of holding the rank of 7 th Dan, Mr. Foster was promoted to the rank of Ku Dan (9th degree black belt) and given the title of Hanshi (Master Instructor) at a ceremony on May the 17, 2003 in Titusville Fl. The rank and title were bestowed by the Shihan and Renshi classes of "Mike Foster's Yoshukai International Karate Association." The Yoshukai Testing Board, Inc members consisting of Board members Michael H. McClernan, William T. Moore, Bob Bush, John M. Matthews, Elizabeth D. Moore, Ricky Copeland, Michael Myer, Dickie Cromwell, Christina McClernan, Lee Farrell and Michael Mendelson on 28/06/08, resigned from Mike Foster’s Yoshukai International Association due to differences in management philosophy. The Board will function as a not for profit corporation doing business as Yoshukai Karate International. Our Mission is to preserve and promote the history and traditions of Yoshukai Karate while maintaining the highest standards of integrity, family values and the fair and equitable treatment of all members.